AcademyHealth 2018 National Health Policy Conference. February 5-6, 2018, Washington D.C.
25th Annual Arizona Immunization Conference . Two Workshops. April 18-19, 2018, Phoenix, AZ. AcademyHealth’s Annual Research Meeting (ARM). June 24-26, 2018, Seattle, WA. The Public Health Improvement Training (PHIT) hosted by National Network of Public Health Institutes and CDC. Presentation Title: "What’s Law Got to Do with It? Developing the Public Health Law Competency of the Workforce Thru Use of Legal Epidemiology". June 26, 2018 - June 27, 2018, Atlanta, GA.
American Public Health Association Annual Meeting 2018. American Public Health Association Annual Meeting. Presentation title: “A National Assessment of Medicaid Coverage, Cost Sharing, and Provider Reimbursement for ACIP Recommended Adult Vaccinations”. November 8, 2017, Atlanta, GA.
IDWeek 2017 (Infectious Disease Week). Presentation title: “Current Landscape of State Healthcare Worker and Patient Vaccination Laws and Challenges to Mandating Vaccines”. October 5, 2017, San Diego, CA. Selected as a mentor for the fourth annual IDWeek Mentorship Program which offers opportunities for mentorship and networking through one-on-one interactions between leaders in the field and fellows, residents and medical students during IDWeek. Centers for Disease Control and Prevention's Inaugural- State, Tribal, Local, and Territorial Public Health Attorney Training Institute. Presentation title: “Vaccination Law at the State, Tribal, Local, and Territorial Level”. August 29, 2017, Atlanta, GA.
Centers for Disease Control and Prevention Adult Immunization Awardee Webinar. “A National Assessment of Medicaid Coverage, Cost Sharing, and Provider Reimbursement for ACIP Recommended Adult Vaccinations”. August 28, 2017, Atlanta, GA.
Centers for Disease Control and Prevention Biweekly Immunization Services Division Seminar. 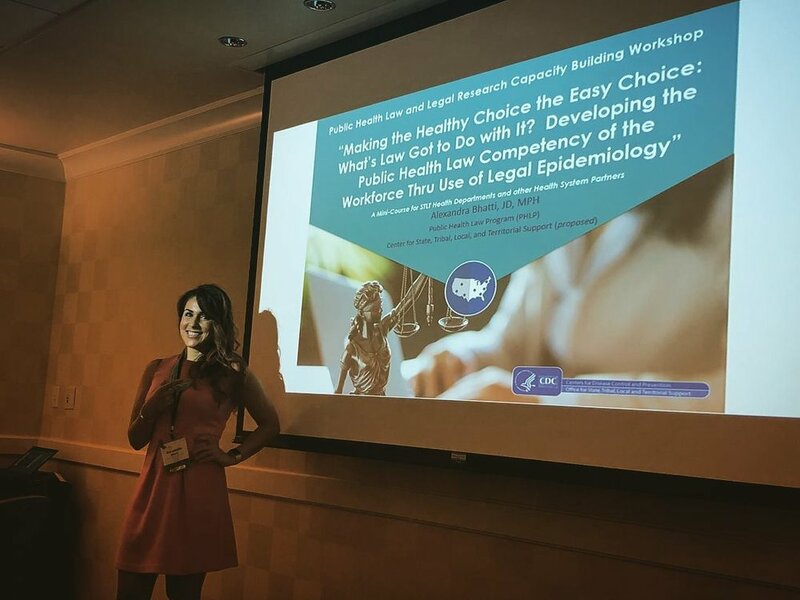 Presentation title: “Legal Epidemiology and A National Assessment of Healthcare Worker and Patient Vaccination Requirements”. June 15, 2017, Atlanta, GA.
Strong Families Arizona Home Visiting Conference 2015. Presentation title: “Building Community Immunity: Learning how to incorporate Immunizations into Home Visiting”. September 9, 2015. Phoenix, AZ. Centers for Disease Control and Prevention Annual Immunization All Awardee Meeting. Presentation title: “Dr. Daniel T. Cloud Outstanding Practice Award: Increasing Vaccination Coverage Through Use of Provider Incentives”. August 20, 2015, Atlanta GA.
Centers for Disease Control and Prevention Annual Immunization All Awardee Meeting. Presentation title: “You Are the Key to Cancer Prevention – 1, 2, 3”. August 20, 2015, Atlanta GA.
Centers for Disease Control and Prevention Annual Immunization All Awardee Meeting. Presentation title: “Using Your Immunization Information System for Assessment, Feedback, Incentive, Exchange (AFIX) Program Assessments – Lessons Learned and Successes”. August 19, 2015, Atlanta GA.
2015 Pima County Childcare and School Vaccination Meeting. Presentation title: “The 3 R’s of School Immunizations: Resources, Records, and Requirements” and “Understanding How to Effectively Use the Immunization Information System for Childcare Immunization Data Reports”. July 30, 2015. Tucson, AZ. Yavapai County School Nurse and Administration Immunization Meeting. Presentation title: “Navigating through School Immunizations”. July 18, 2015, Flagstaff, AZ. Arizona Department of Health Services Annual Immunization Conference Plenary Presentation. Presentation title: “School Vaccination Coverage Data And What You Need to Know”. April 22, 2015, Phoenix, AZ. Strong Families Arizona Home Visiting Conference 2014. Presentation title: “Immunization: Strong Communities-Strong Families”. September 10, 2014, Phoenix, AZ. 2014 Public Health in Schools Conference. Presentation title: “The 3 R’s of School Immunizations: Resources, Records, and Requirements”. July 22, 2014. Tucson, AZ. University of Pittsburgh Graduate School of Public Health - Public Thesis Defense. Presentation title: “Optimization of TDMH With RT-PCR As A Rapid And Sensitive Diagnostic Tool For Mycobacterium Tuberculosis” December 1, 2011, Pittsburgh, PA. Boys & Girls Clubs of America Teen Conference- Keynote Speaker. Presentation title: “Promoting S.T.E.M. Education: My Journey- Be Curious, Be Fearless, and Above All Else- Follow Your Gut” March 14, 2010, Pittsburgh, PA.
"Spot Shot" Award: Outstanding media coverage to educate the public about the value of immunization as a preventive health strategy. (80 Arizonans honored for raising immunization rates, saving lives) April 2015.